It isn’t usual protocol on the Guardian’s fashion desk to flag up the moment that a Hollywood star gets a new stylist to fix her up with some frocks on the red carpet. 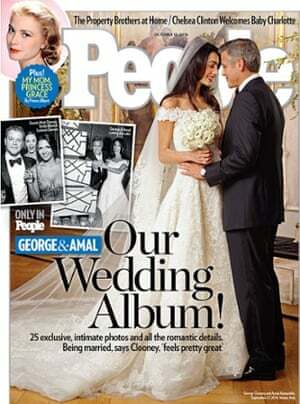 Not even when it is human rights lawyer and (apparent) Audrey Hepburn fangirl Amal Clooney. 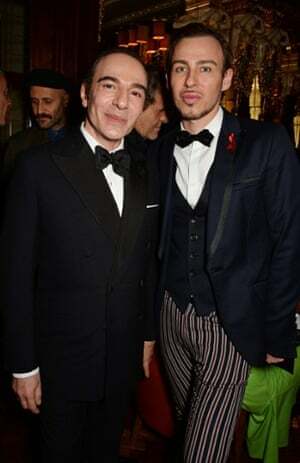 But when the stylist in question – Alexis Roche – is the long-term partner of John Galliano, it would be remiss of us not to mention it. The pairing answers the nagging question of why Amal has worn Margiela twice on the red carpet already this year – most prominently at the Met Ball. Turns out this was neither a sartorial gaffe nor a nuanced message about freedom of expression to back up her criticism of Turkey. Instead, it is clear that Roche has been exercising his right to sartorial bias with a suitcase full of his beau’s designs. Happily the stylist has been sharing his work on Twitter. His @lexyroche handle reveals that he was the wardrobe force behind Kendall Jenner’s Azzedine Alaia crop-top-and-ballgown Cannes appearance. Ditto her lupin-like Calvin Klein dress at the Amfar benefit. This means his influence straddles the politico-Kardashian-Hollywood universe. Which is pretty cool, right? As is evident from the above picture from US Vogue’s Instagram account, Roche is literally and metaphorically In The Room. He stands in the background wearing the white lab coat worn by all Margiela staff as Galliano pins Clooney into the Met Ball dress. To his right stands Anna Wintour. 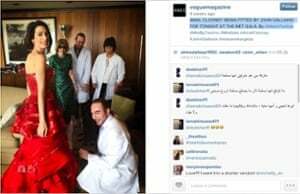 It is the event that symbolises Wintour’s influence over the fashion industry, and Roche is present. Other stylists would kill for those coordinates. He is top pals with uber-stylist Edward Enniful and has made cameo appearances on Alexa Chung’s Instagram feed (he styled her in the Longchamp campaign). He has also worked with Chinese supermodel Lui Wen. In technical speak: he has the fashion industry indisputably covered. Pinch-of-salt speculation, but when you think that a) he’s In The Room, and b) Galliano started his industry rehabilitation via a stint of work at the Oscar de la Renta, and c) the fashion world is tiny, then this thesis starts to make sense. Other rumours now doing the rounds include the theory that Amal’s new fondness for Margiela, coupled with her blossoming friendship with fashion industry overlord and Galliano cheerleader Wintour, will see her soon appearing on the US Vogue cover wearing the brand.